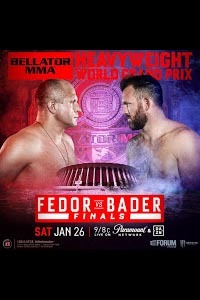 Bellator 214: Fedor vs. Bader took place January 26, 2019 at The Forum in Inglewood, California. • Fedor Emelianenko vs. Ryan Bader (HW Championship): Ryan Bader def. Fedor Emelianenko via KO (punch) at 0:35 of Round 1. • Henry Corrales vs. Aaron Pico: Henry Corrales def. Aaron Pico via KO (punches) at 1:07 of Round 1. • Jake Hager vs. J.W. Kiser: Jake Hager def. J.W. Kiser via submission (arm triangle choke) at 2:09 of Round 1. • Juan Archuleta vs. Ricky Bandejas: Juan Archuleta def. Ricky Bandejas via unanimous decision (29-28, 29-28, 29-28). • Adel Altamimi vs. Brandon McMahan: Adel Altamimi def. Brandon McMahan via submission (armbar) at 1:16 of Round 1. • Jesse Merrit vs. Thor Skancke: Thor Skancke def. Jesse Merritt via submission (north-south choke) at 4:26 of round 1. • AJ Agazarm vs. Jesse Roberts: Jesse Roberts def. A.J. Agazarm by split decision (29-28, 28-29, 29-28). • Weber Almeida vs. Odan Chinchilla: Weber Almeida def. Odan Chinchilla via TKO (head kick and punches) at 3:04 of round 1. • Sean Johnson vs. Art Rivas: Art Rivas def. Sean Johnson via TKO (knees and punches) at 4:30 of round 1. • Tyler Beneke vs. Jay Jay Wilson: Jay Jay Wilson def. Tyler Beneke via submission (rear-naked choke) at 1:31 of round 1. • James Barnes vs. Ryan Lilley: Ryan Lilley def. James Barnes via head kick KO at 1:03 of round 1. • Ian Butler vs. Craig Plaskett: Craig Plaskett def. Ian Butler via unanimous decision (30-27, 30-27, 30-27). • Steve Ramirez vs. Desmond Torres: Desmond Torres def. Steve Ramirez via sub (arm-triangle choke) at 4:21 of Round 1.